Well, Star Plus’ No 1. ranker series ‘Iss Pyaar Ko Kya Naam Doon’ to go off air this week. The male protagonist, Barun Sobti has quit for personal reasons. The channel thought it better to wrap up rather than replace, considering his popularity. A first of sorts, I gather. The daughter who absolutely adored Arnav Singh Raizada and Khushi Kumari Gupta for their non stop banter, is feeling bad for them. Though, off late, we’d given up on the series as it wasn’t going nowhere, post the marriage. However, she was real happy that she could meet them earlier this year, as a Valentine’s Gift from Mommy dearest. 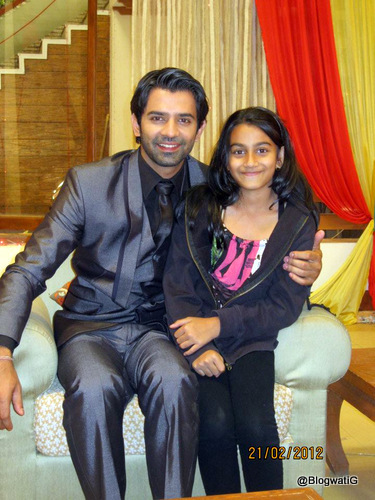 She even made a card for all of them that Barun so sweetly read and kept. Unlike his on screen avataar, Barun was the prankster on the set. Khushi, poor girl was having a bad throat, yet was smiling and looking pretty. 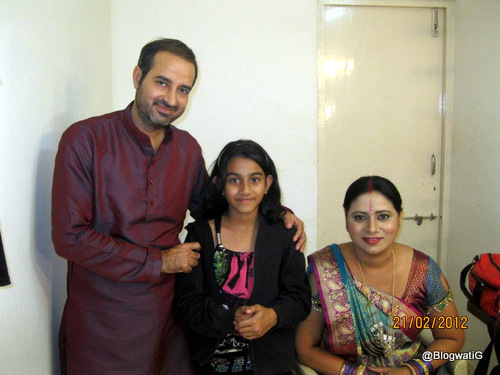 The wedding sequence was being shot. Payal and Aakash, pretty much the dedicated parallel leads, were gracious to talk to. 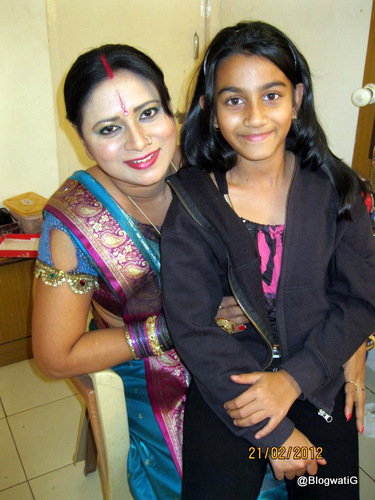 Anjali who I met post a very long hiatus, pretty as ever. 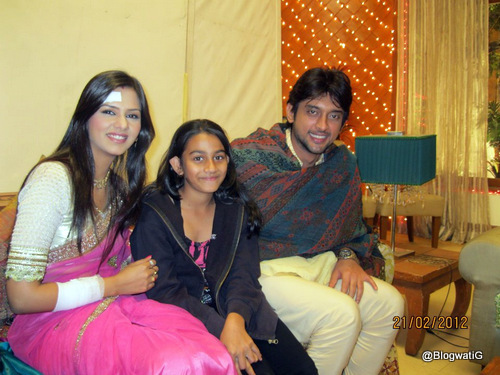 Shyam who we did not like in reel life but in real, quite the gentleman. Nanhe was just the cute boy next door. Mami was an absolute delight to talk with, in impeccable English, believe it or not. Mamaji, the dear friend who organised this outing for the princess. Nani who I’d seen as a child, was was a delight to meet after so many years. Please Note : All photographs are personal and belong to the author and may not be used in any form. Meeting Barun face to face is a dream come true for every young girl these days..He’s the crush of almost all young gals who watch daily soaps..
Chips from a life…….still trying to place you….sorry! Aur yeh sleepless doctor kaun hai? 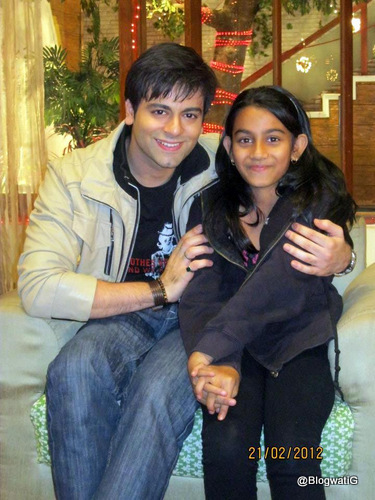 Harshita, that was so sweet….well, who knows…..maybe someday you might meet him after all! Bikram, trust me, you are not missing anything by not watching the serials……lol! The title of ur latest post caught my interest and I wandered in:-)…I too watched the serial and loved the chemistry between the leads. 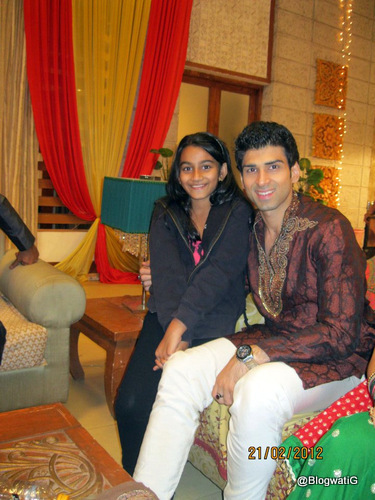 You met them on the sets huh…coool!!! I posted this comment in another page bcoz I didnt see the comment link. Just saw it now;-P.
Junior will have to find other things that will make her beam with happiness, I guess. Till then she can stew in her anger at this comment. I just hope it is not another similar show. How I miss life-affirming and entertaining shows like Nukkad, Karamchand, Sarabhai Vs Sarabhai, Civilization with Kenneth Clark, Bharat Ek Khoj, Picket Fences, and Boston Legal. They actually helped broaden your horizon instead of getting sucked into relationship struggles of imaginary characters inhabiting an unreal social world. In all fairness, the male lead (Arnav) is attractive as a male lead, in spite of his pink lips and difficulty opening his jaws to speak. Ha ha ha Shubho…..don’t worry, the daughter just calls the dibs. We couldn’t care for the story. The guy was cute, all said and done. And well it wasn’t that devious as half the nonsense. We were the lucky ones to have good TV, but bad cinema. Today the tables have turned! May be i ll get to meet chris nolan then! Arreeee ab toh serial hi khatam ho gaya……ab kahan?